Domaine Font de Michelle has a long history in the Southern Rhone Valley. At least the current owners, the Gonnet family does. They have been living in the region since the 1500’s! However, the birth of Domaine Font de Michelle can be traced to 1880 with Jean Etienne Gonnet started a farm which included olive trees and 3 hectares devoted to grapes for wine. The estate took its name from a small, difficult to find spring, Fontaine de Michelle. However, it took until 1950 for Domaine Font de Michelle to become fully established as a winery. At the time, the Gonnet family were well known in the appellation. Etienne Gonnet was married to a member of the Brunier family, which own Vieux Telegraph. Etienne Gonnet also served as the mayor for over a decade. Today, Font de Michelle is managed by Guillaume Gonnet, who took over the estate from his father, Michel Gonnet. Domaine Font de Michelle took its name from a small spring located in the vineyards of the property. Domaine Font de Michelle owns 27 hectares of vines in the Chateauneuf region. 25 hectares are used for planting red wine grapes and 2 hectares are reserved for the production of Chateauneuf du Pape Blanc. Like many estates, the soils and terroirs are spread-out and varied, with different soils. Their best land is situated on the La Crau plateau. They also have vines in the Croix de Bois lieu-dit they purchased in 2016. They have a south east facing terroir with rocks, stone, clay and limestone soils. However, their vineyards are widely dispersed throughout the appellation. The vineyards are farmed using organic farming techniques. The best vintages of Domaine Font de Michelle are: 2018, 2017, 2016, 2015, 2012, 2010, 2009, 2007, 2005, 2001, 2000 and 1998. 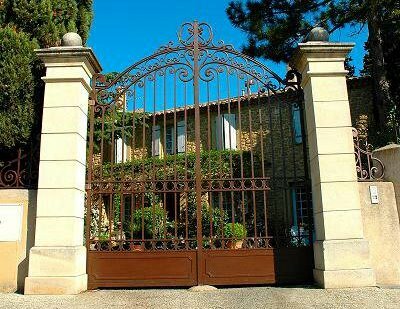 Domaine Font de Michelle produces 3 red Chateauneuf du Pape wines and 2 Chateauneuf du Pape Blanc wines. Domaine Font de Michelle Tradition is produced from a blend of 70% Grenache, 10% Syrah 10% Mourvedre and 10% Cinsault. A portion of their fruit is whole cluster vinified. It is also interesting to note that some of the parcels are co fermented, meaning the various grape varieties are vinified together. The wines of Domaine Font de Michel are aged in a myriad of different vessels including traditional cement vats, old foudres, demi-muids that vary from 600-800 liters. They had been using a small amount of French oak barrels, but those are not used much today. The production is about 6,750 cases per year. Domaine Font de Michelle Cuvee Etienne Gonnet is produced from grapes grown in the La Crau sector. These are old vines, many of which are more than 110 years of age. The is often a blend of old vine, 70% Grenache, 15% Mourvedre and 15% Syrah and Mourvedre. The Grenache is aged in a combination of vat and demi muids. The Syrah and Mourvedre are aged in demi-muids that are only one year old. About 1,250 cases are produced each vintage. Domaine Font de Michelle Elegance de Jeanne – In 2007 to honor the grandmother, Domaine Font de Michelle introduced a new wine to their portfolio called Elegance de Jeanne. Produced from the estate’s oldest Grenache vines, there is very little wine to find. Only 200 cases are produced each year. Domaine Font de Michelle Blanc is made from a blend of White Grenache, Roussanne, Clairette and Bourboulenc. The wine is vinified and aged in thermo-regulated vats. The Roussanne is aged in used, French oak casks. The wine is aged for 9 months before bottling. Domaine Font de Michelle Cuvee Etienne Gonnet is made from a blend of 50% old vine Roussanne and 50% Grenache. The terroir is limestone and clay in a cooler terroir. The Roussanne is vinified and aged in new, French oak casks. The Grenache is vinified and aged in used oak barrels. Both varieties are aged for about 8 months before bottling. The production is limited as only 125 cases are made in most vintages. The wine is only made in the best vintages. Domaine Font de Michelle can be enjoyed on the young side with decanting of 1-2 hours or so. This allows the wine to soften and open its perfume. Older vintages might need very little decanting, just enough to remove the sediment. v is usually better with 3-4 years of bottle age. Of course that can vary slightly, depending on the vintage. In the best vintages the wine should be consumed within 4-15 years after the vintage. Domaine Font de Michelle is best served at 15.5 degrees Celsius, 60 degrees Fahrenheit. The cool, almost cellar temperature gives the wine more freshness and lift. Domaine Font de Michelle is best served with all types of classic meat dishes, veal, pork, beef, lamb, duck, game, roast chicken, roasted, braised, stewed dishes, sausage, barbecue and cassoulet. Domaine Font de Michelle is also good with Asian dishes, hearty fish courses like tuna, mushrooms pasta, eggplant, cheese and tomatoes. The white wine of Domaine Font de Michelle is best served with a myriad of different seafood dishes, shellfish, crab, lobster, sushi, sashimi, chicken, pork and veal, as well as Asian cuisine. Domaine Font de Michelle also produces red and white wine in the Cotes du Rhone appellation from 21 hectares of vines. Kirsch, kirsch and more kirsch is all over the place in this forward, medium bodied wine, that also serves up notes of thyme and pepper. This is already drinking well, so enjoy it while waiting for the 15 and 16 to develop. Polished, bright and fresh, with a sweet, crisp black cherry core of ripe fruit. Using 70% Grenache, 15% Mourvedre and 15% Syrah produced a wine with sweet red fruits, garrigue, pepper and spice, turning this into a silky, forward, charmer. From 100% old vine Grenache, the wine is balanced and elegant, with soft, layers of ripe red berries that shine through. This is very sweet and refined. Medium bodied, with garrigue and fresh, sweet red berries in the nose, the wine is soft, textured, the fruit is ripe and as it’s already open, it’s delicious today. From 70% Grenache and assorted varieties, the wine reached 15% alcohol with no sensation of heat. Spicy, peppery, soft, ripe fruits in a forward style that is already showing its stuff. The wine is fresh, ripe, rich, spicy and jammy, with layers of polished black raspberries, kirsch and garrigue. This bottle was finished far too quickly. With its forward, luscious character, ripe, sweet, cherries and kirsch, pepper, thyme, garrigue, and silky textures, it's easy to understand why. Close to fully mature, lots of cherries, earth, thyme and spice on the nose. Medium/full bodied, with a soft, sweet, black raspberry finish. Forward, open and expressing its kirsch, licorice, earth and black cherry core, the wine is plush, round and inviting, finishing with sweet, ripe, spicy black raspberries. This is probably not a wine to age in the hopes its going to make old bones. It's really drinking nice tonight with dinner. Lush and plush, with ripe black cherries, herbs, pepper and earth, this is drinking in the sweet spot. Fully mature, the fruit has faded since it was first released. Still, there is a sweet, kirsch, pepper, earth and garrigue profile, along with silky textures that make this a lot of fin to drink.